In this post you see the basics about framework and implementation application in Pega. The primary focus of any application will be to increase the maximum re-usability as well as support scalability. Amazon plans to provide Pega CRM solution to Sales division and if it is a success, then they may want to expand the solution to other divisions. Here, we will be creating a framework application and implementation application for sales. Business may have some common features for all the 3 divisions. You can bring those to framework application so that it can be reused whenever we extend to other divisions. Implementation application contains rules and business specific to Sales division. How do you start building an application? If we are going to built any application, say java application what will we do? We need Java Development Kit (JDK). We will import the required packages and start create project by coding. We need to buy the licensed Pega product from Pegasystems. Initial Pega product contains configuration files along with ‘PegaRules’ application. We can call it as a framework application. But we won’t. We call it as Pega base application. All the standard OOTB rules like CreateAddWork, UpdateStatus, some standard UI will be included in the PegaRules application. Pegasystems not only provide the base product, they built framework application for specific business requirements. Say for a call center CRM application, Pegasystems builds a CPM framework application over base product. We can purchase the CPM Framework, a licensed product and use it as a framework. We call it as solution framework. Solution framework can be used 70% to complete application which we can extend to satisfy our requirement. Imagine 2 brothers bought a single land. They planned to live together. They decided to build a 2 storeys building. Ground floor – Common hall and kitchen. First floor – Individual home for brothers. First they decided to build a single home in the first floor and planned to extend the first floor in future. 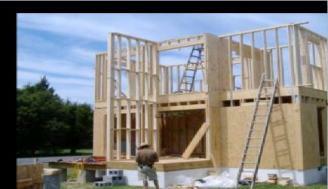 I am going to compare the house building with Pega Application building. Step 1: You are going to buy a land. Pega: Buy a Pega Licensed product –PegaRules application. Step 2: You have an option to buy the land with the basement laid. Pega: You can buy a Solution framework based on your business. Step 3: You need to build the ground floor. Remember ground floor contains the common rooms like kitchen and hall. 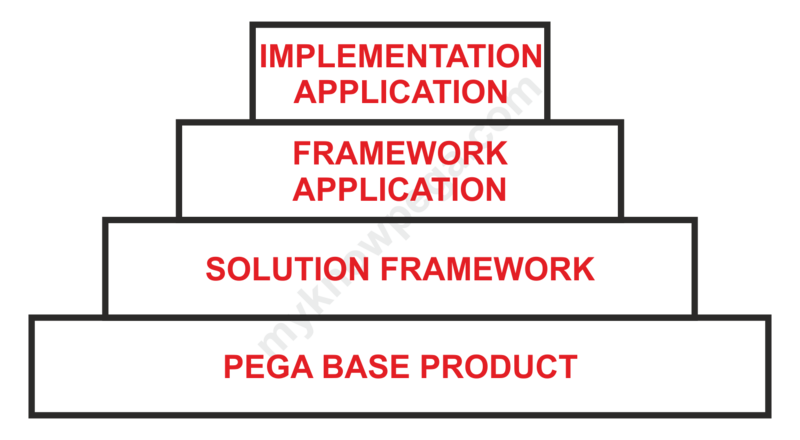 Pega: Build a framework application extending solution framework or PegaRules. Bring all the common rules under framework application. Step 4: Now you will build a room in the first floor extending ground floor. This room will house the things that belongs to a particular brother. Pega: Build an implementation application extending framework application. Bring all the rules specific to that division in the implementation application. Implementation application can use the rules in framework, solution framework, Pegarules application. Framework application can use rules in Solution framework as well as PegaRules, but not in Implementation application. These rule resolution are based on class inheritance which we will see in the next post ‘Enterprise class structure’ (http://myknowpega.com/2017/05/13/enterprise-class-structure/). Thank you so much. Please subscribe and stay tuned for more posts. I want to switch to PEGA technology from Service Cloud, so I need hands on for this. Could you please guide me for this, it would be very helpful. I’m having some idea regarding video tutorial. Will implement it soon, Shiak. Great Article Bro, easy to understand. Nice Article, Can you share the step by step process of Soap service exception handling, watching the end point url. What are error scenarios, exceptions and exception handling? prem can you explain activities and its methods uses. Thanks Praveen :). I started working on activity methods !! In the latest version of pega , we have only two options . So as Per your examples for sales platform we cant have both framework and implementation together created . so as per latest version , should we need to create framework and implementation separtely ? Please explain about What is class structure and how to define ? It’s amazing blog. I gone through some of the topics and I am able to understand the topics very easily. Thank u so much. Thank you so much for your appreciation. 🙂 I’m feeling happy with your comments. Just a word for your explanation “Awesome”. It will be great if you post a video. I have also started reading your site and all the posts are really awesome ans structured. -3 Frameworks respective for HR, Finance and Marketing. -I want basic process of all 3 divisions should be same in all the countries but look and feel and some other component should be different based on country. I request you to make it more complex if its possible and provide me the solution class design and rulesets arrangement. Please you can call me if any understanding/discussion is required, as i am looking for best and standard way to design this kind of scenario. Have you got the response for this ? Can u please explain about abstract classes and Concrete classes ? I have a question, can we have org,div and unit layers without having FW layer directly..? I have been going through your posts and found it quite helpful to understand the basics with a great mix of hand on. Thank you for all your efforts. Can you please explain the difference among work objects, Covers and folders? your explanation is unbelievable and its awesome. congratulations for this very helpfull blog. Trying to figure out how the application rule will look like in your example of the 2 brothers. The implementation application will be “built on” the framework application, right? Then we will need to bring in the framework implementation using direct inheritance, right? On which class? Your blog is very helpful.what happens if we create all rules (reusable and specific rules related to that division ) in framework application itself. It is very clear to understand.Looking forward for many posts. Amazing posts. I am relying on your post for so many topics. Request you to add new topics related to Pega DSM also. customer brought pega application and some health care frame work also and again we need to implement the framework for reusable rules ?? can,t we direct implement implementation layer on health care framework?